One of my favorite pork rib recipes, Instant Pot Sweet and Sour Country Ribs are very flavorful and tender. They are a dump in the pot and push start recipe. If you like country style ribs with an Asian flavor, you will like these pressure cooker sweet and sour country style ribs. Country style ribs are the very first thing I made in my Instant Pot® over two years ago. I may have overcooked them a bit, but they were still delicious! It was that moment that I knew I was going to love this electric pressure cooker! One of the most requested Instant Pot ribs recipes I’m asked for is Instant Pot Country Style Ribs. This sweet and sour version has a lot of flavor, and is easy to make. 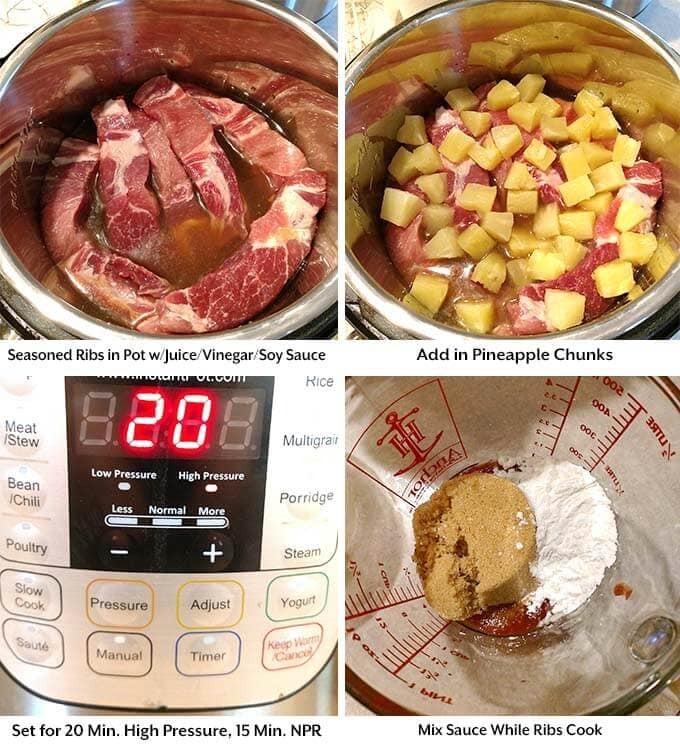 This recipe for Instant Pot Sweet and Sour Country Ribs is really easy to make. The sweet and sour sauce is rich and tangy. 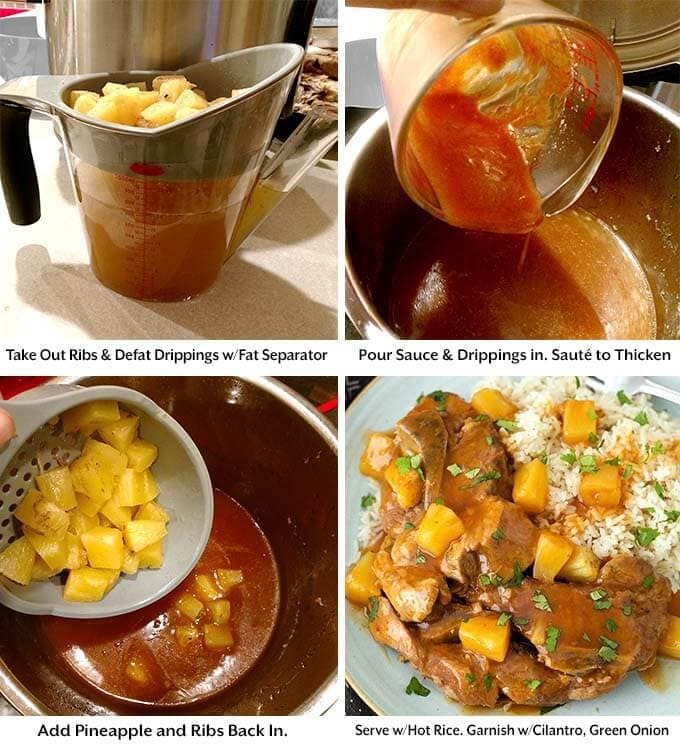 The sweet pineapple chunks are delicious with the pork (I love pork and fruit together). 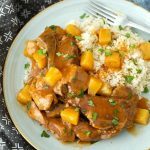 You can use boneless or bone-in country style ribs for this Instant Pot Sweet and Sour Country Ribs recipe. They will cook up very tender and delicious! 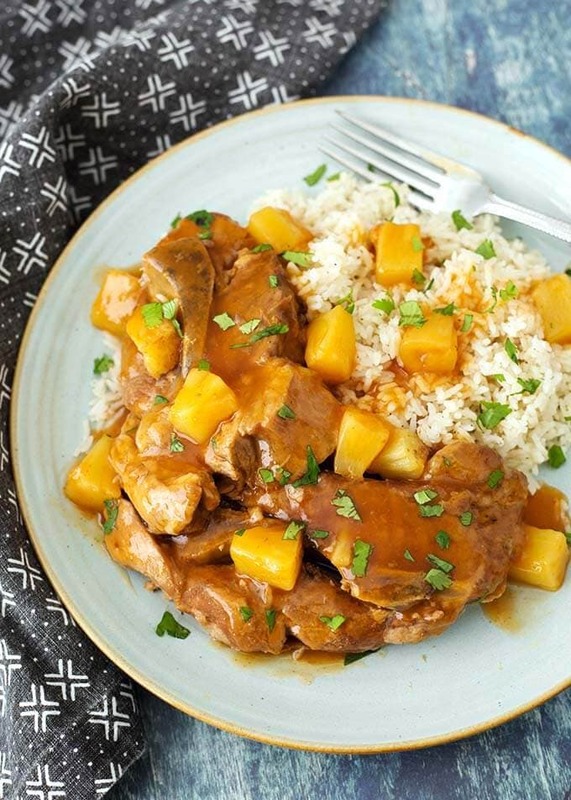 Serve these Instant Pot Sweet and Sour Country Ribs with some hot cooked rice, and a green salad or vegetable side dish for a delicious, complete meal! 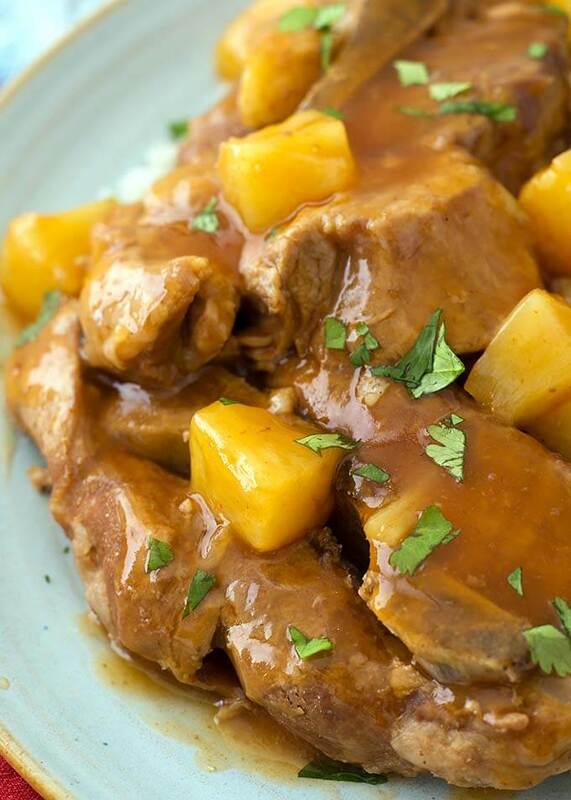 Instant Pot Sweet and Sour Country Ribs have a delicious tangy-sweet sauce, and the meat is fork tender. These pressure cooker country style ribs are easy to make and they are so good! Season the ribs with the coarse salt and set aside. Pour the pineapple juice, vinegar, and soy sauce into the pot. Add the ribs in an even layer. I put them in on their sides and they fit in my 6 qt just fine. Sprinkle the pineapple chunks over the ribs and close the lid. Set the steam release knob to the Sealing position. Press the Pressure Cook/Manual button and then the + or - button or dial to select 20 minutes. Pot will take a few minutes to come to pressure. This would be a good time to make the rice, if you haven't already. In a bowl, mix together the ketchup, sriracha, corn starch, and brown sugar. Set aside. When the cook cycle has finished, let the pot sit undisturbed for 10 minutes (10 minute natural release). Then manually release the remaining pressure by turning the steam release knob to the Venting position. Remove the ribs with tongs to a plate, cove with foil. Set aside. Pour the liquid/drippings into a fat separator, straining out the pineapple chunks. Pour half of the defatted liquid back into the pot and turn on the Sauté setting. When the liquid starts to simmer, whisk in the ketchup mixture. Keep stirring until it thickens. If you need more liquid, stir some more in. Turn off the pot. Add the ribs and pineapple chunks back into the pot and coat with the sauce. Serve over hot white rice, and spoon over extra sauce. Garnish with cilantro or green onions. We loved these ribs! I buy them in bulk and make lots of things with them, and this was a new way to make them for me. The whole family loved them! Hi Luann, I’m so glad the family enjoyed these ribs! Thank you for your review!